The second post-trump episode of Dykes to Watch Out For. 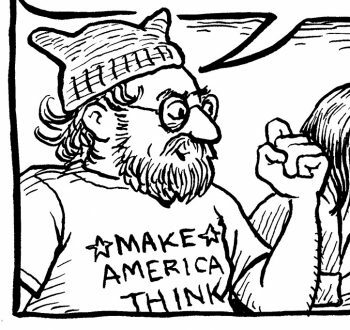 It’s up on the site of Seven Days, my local alt weekly here in Vermont. I plan to continue doing these on an occasional basis as a way of staying sane. You’re helping us stay sane, too. Now to prepare for the March for Science in DC next week. I love that you’re going to keep doing these. It’s a gift. I know it helps me. I’ve been going every week to a gathering to make phone calls and send postcards. I feel…I feel confused sometimes about whether or not that helps, but I’m clear that I need to keep trying. Sent a big, old stack for March 15. I, too, love that you are going to do these on an irregular basis. So happy! Dear ghods, how I’ve missed DTWOF! A fan since the early days, and it’s a balm to read new strips, however sporadic. Thanks for the continuing exploits, and congratulations on the ascension to Cartoonist Laureate! Oh my God. I am so happy. It’s so nice to see everyone again.